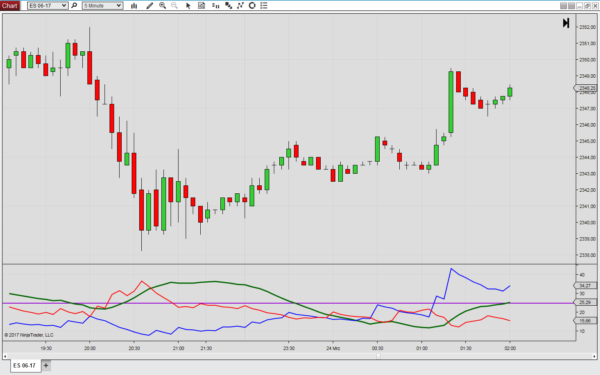 The Directional Movement indicator (DM) supplied with NinjaTrader cannot be used with an input series other than price. We have recoded it so that you may apply it to other indicators. To do so, simply select any of the other NinjaTrader indicators as input series. The Directional Movement indicator elaborates on the ADX study (as introduced by Welles Wilder). In addition to the ADX, the indicator applies two different standard indicators, one negative and one positive. The two lines are plotted on the same chart to show the direction of the trend and a third line, the average directional index, or ADX, shows the strength of the move.